-30 x 20 field with 2 end zones at each end of 5yards (See Diagram). Place half of the balls in each end zone. Each team selects 2 players to be the defenders. Team line up on opposite sides of the field and the defenders position themselves between the 2 end zones(See Diagram). On the coaches command the teams run across to the opposite end zone, pick a ball and attempt to carry the ball back to their end zone without being tagged by the defenders. If tagged the ball is replaced and they must try again. The team with the most balls in there end zone after a set time is the winner. Players now have to dribble the ball across, defenders must also dribble a ball. Players must dribble the ball past the defender who are now attempt to touch the ball with their feet. -On the balls of feet; Keep ball under control; Head up and obeserve defender; Timing and distance of feint; Quality of disguise and execution of feint; Change speed and direction; Accelerate away lifting head up while keeping ball under control; Encourage players to dribble and take players on when space is available. Teams line up as shown in the diagram. The Coach numbers players in each team. 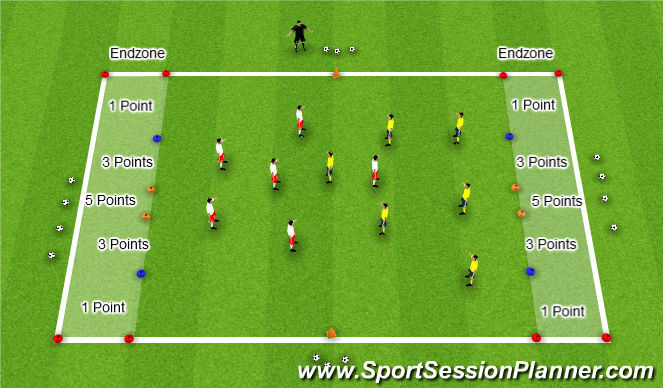 The Coach plays a ball into the field and calls a number. If player dribbles into their opponents endzone their team gets a point. 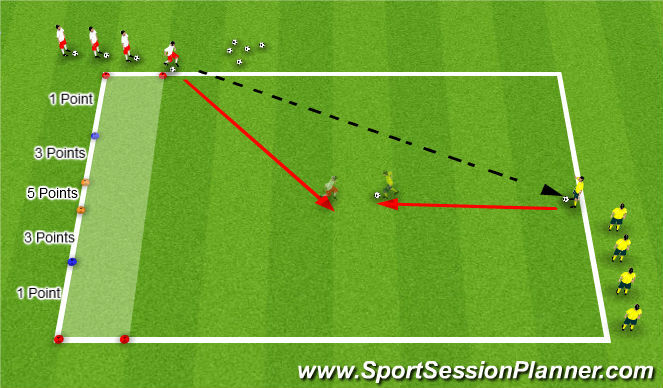 -White players pass to Yellow attackers. 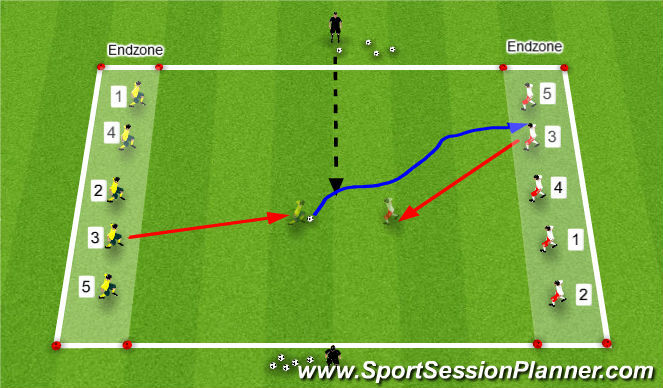 -Yellow attacks White and has #seconds to dribble the ball pass the goal line (1, 3 or 5 points). -After each 4-7 minutes switch roles. 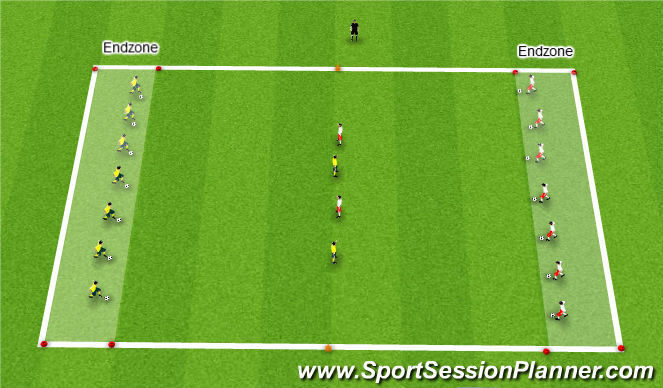 -Teams are to dribble the ball pass the goal line (1, 3 or 5 points). -If ball goes out of the field players can make the decision to either pass or dribble in. Once the ball has entered the endzone through one of the gates the defensive team must retreat to the Retreat Line at halfway.